Kolhapuri chappals are made from leather that is cured and tanned using only natural ingredients, without any chemicals. They are also completely handmade. This makes the chappals suitable for all types of wearers. They turn soft and comfortable after contact with the body heat and sweat of the person wearing them. Many retailers in Kolhapur claim medicinal properties for them for these very reasons. After the ban on slaughter – and consumption — of all members of the cow family, that is, cows, bulls and calves, farmers find it difficult to sell their old cattle; while this ensures that no beef comes in the market, it also has meant that leather, which came from oxen, has disappeared. But, while the VHP and other organisations may have been happy, for farmers and others it has been a nightmare. In many districts of Maharashtra, facing what would be three straight years of drought, farmers have been left wondering what to do with cattle they could neither feed nor sell. The BJP’s own MLA from drought hit Ashti in Beed district, Bhimrao Dhonde, fully aware of what his constituents were going through, raised a question recently in the Assembly criticizing the impact of this law on farmers’ lives. The cycle of farming-slaughter-tanning-leather goods production has been seriously disrupted. This has drastically affected the price of this type of footwear. The lowest grade chappal, which was earlier sold for Rs. 150/- now sells for a mimimum of Rs. 330/- The better quality ones, which are referred to as ‘antique’, for their traditional designs and good quality leather, cost at least Rs. 2500/- and sometimes even more that. 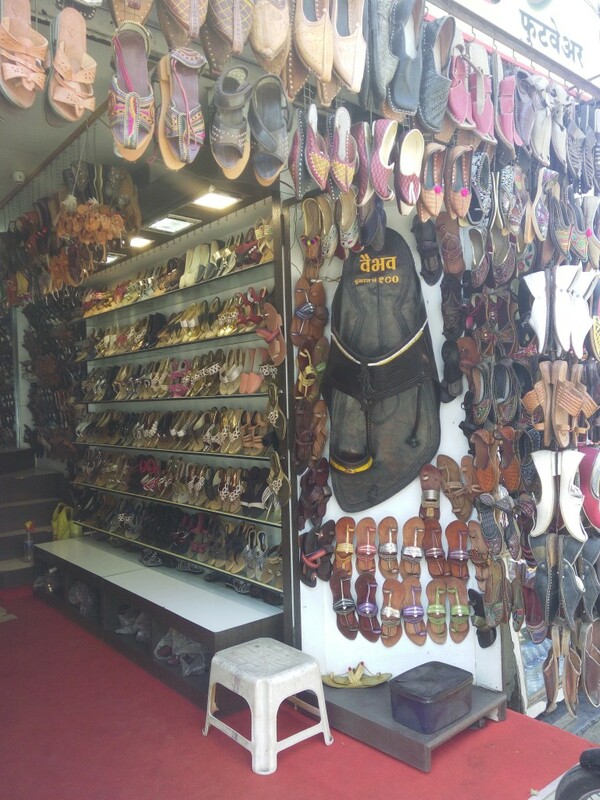 Besides, a huge market of cheaper chappals made with non-leather materials like vinyl and embellished with artificial zari or string is also being palmed off on customers seeking Kolhapuris. At the co-operative headed by Powar, a seasoned craftsman, Pandurang Chavan who still makes the chappal at home along with his wife. He brings in a beautiful pair, which costs a pricey Rs 6000; the tiny braids used to embellish the upper part of the chappalwere all done by his wife. These kind of artisanal slippers are not for the mass market; each pair takes a week to make. He is proud of them, but soon turns bitter about not getting much assistance from the government—“banks put a thousand conditions and this makes it difficult to get loans, he says. Arun Krishnarao Satpute, founder and chairman of the Kolhapuri Chappal Audyogik Samook says the craft is dying-the number of craftsmen is dwindling and the cow protection law will finish it off. Pointing to the ten or twelve workers in his workshop, Satpute says bitterly, “Each of these men has debts of a lakh or two on his head. How are they to survive when the costs of living also keep going up?” Satpute has been involved in many efforts to keep the Kolhapuri chappal tradition alive. From trying to get a GI registration for Kolhapuri chappals to trying to have an ITI or University course designed to teach the craft, he is trying pursuing different avenues to keep the business active. But with the cost of raw material going up, it is going to be a tough task.